I was recently in Hong Kong and Macau at the Fulbright midterm research conference. When talking with my fellow Fulbrighters, I was often asked to describe my research findings about green buildings thus far. This event was a great chance for me to reflect upon what I’ve learned about green buildings during my time in China. Sometimes in the course of focusing on specific topics on my blog, I lose track of the bigger picture. This post will describe the key findings from my research so far: while China has made progress with green buildings, it hasn’t gone nearly far enough. I will focus the rest of my time here on finding solutions to how China can realistically tackle the many barriers to green buildings and achieve a vision of green buildings for everyone, everywhere. When people imagine the chief causes of greenhouse gas emissions in China, many think of coal power plants. While true on the surface, this popular perception misplaces the real blame. After all, where does that electricity produced by coal power plants ultimately go? To power buildings, primarily. The reality is, the energy used in buildings- both in their operation and construction- represents almost 45 percent of China's total annual energy use and a similar share of China’s greenhouse gases. This means that buildings in China alone account for more greenhouse gas emissions than all of Japan and Russia, combined. In addition to greenhouse gas emissions, buildings also consume large amounts of land, water and material resources. The environmental impact of buildings is growing rapidly. According to McKinsey, China will have one billion urban residents by 2030. Providing housing and employment for the urban billion will require China to continue its unprecedented construction boom. The result will be an estimated 40 billion square meters of construction between now and 2030, spread over 5 million new buildings. Although China currently boasts one of the lowest building energy uses per capita, this is quickly changing for two primary reasons. 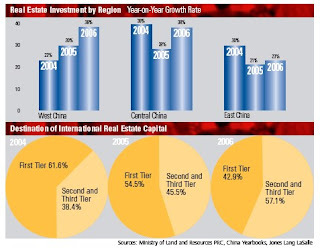 First, as incomes rise, Chinese are demanding more and more floor space per capita. For example, floor area per capita in Beijing doubled from 2001-2006. The result is more buildings and therefore more energy use per capita. Second, as services like heating, cooling and hot water become more common, each square foot is using more energy. According to Lawrence Berkeley National Labs, only 20% of office buildings nationwide had cooling in 2000. By 2020, this is expected to nearly triple to 55%. The result will be much more energy use per square meter. For example, highly-developed Shanghai’s energy consumption per square meter increased 31% from 1998 to 2005 thanks to a mix of increased energy use for heating, cooling, lighting and water heating. As other cities and provinces catch up with Shanghai and demand similar levels of comfort, this will result in continued increases in energy intensity nationwide. When this data is coupled with the growth in overall floor area, the energy use and greenhouse gas emissions scenarios for China’s buildings look bad. Add to this mix the fact that inefficient buildings built today will continue to pollute and use energy for 40+ years, and the situation is downright scary. Despite this dirty and worsening picture of China’s built environment, there is a small bright spot emerging: the number of LEED-certified high performance green buildings in China is growing rapidly. LEED-rated buildings can save significant energy, water, and materials resources and reduce carbon dioxide emissions. LEED first came to China in 2006 when the Ministry of Science and Technology demonstration building called Accord 21 achieved a LEED Gold rating, using 73% less energy than the average government building in Beijing and 60% less water. Since Accord 21’s completion, LEED has seen dramatic growth in China. As of February 2009, over 118 Chinese buildings had registered to seek LEED certification, and many more businesses have registered their intent to green their offices according to LEED standards. In fact, Rob Watson, an international green building expert, estimates that over 50% of class A office building coming online in Beijing and Shanghai over the next two years will seek LEED certification. This is fantastic news, almost on par with American cities noted for their greenery, like New York or Portland. The problem is, this high level of penetration is primarily confined to the tier 1 cities. LEED projects have sprouted up in tier 2 cities like Tianjin and tier 3 cities like Wuhan, but most LEED buildings continue to be in the highly developed areas near Beijing, Shanghai and Shenzhen. This is problematic because the vast majority of building is occurring outside of these tier 1 regions. Moreover, the growth in construction in the tier 2 and 3 cities is actually much faster than that in tier 1 cities, meaning more construction will be in these secondary markets in the future. More worrisome is the fact that LEED buildings are almost exclusively confined to the high-end of the market: Class A office, luxury apartments, and factories owned by multinational corporations. Unfortunately, this does not even come close to covering the entire market. The urbanization statistics shown earlier imply that a significant amount of space is going to have to be created for people who have yet to be urbanized. This certainly won’t be luxury apartment space. And what about for all those companies not ready or willing to occupy Class A office space? While 100+ LEED buildings is promising, this is nothing compared to the 5 million buildings to be built between now and 2030. Clearly, LEED alone cannot even begin to stem the tide of increasing greenhouse gas emissions and energy use in Chinese buildings. Unfortunately, while the government continues to show strong interest in building energy efficiency programs, I haven’t seen much happening outside of LEED. China should not accept this state of affairs. Much, much more can and must be done to reduce the environmental impact of China’s buildings. Green buildings for everybody, everywhere will have to be the goal for China to reduce greenhouse gas emissions and other environmental impacts while making room for unprecedented urbanization. But how can China spread green buildings to Tier 2 and 3 cities and the countryside? How can China spread green buildings to all segments of the market? How can they do it within the timeframe needed to avoid locking-in future carbon emissions and prevent catastrophic global warming? Most importantly, how can they transform the market at an acceptable cost, or even at a net benefit? Trying to answer these questions will be the focus of the rest of my blog posts and my research in China.